Welcome to the 2nd Day of the First Annual Virtual Craft Show! Visit Day One by clicking here! 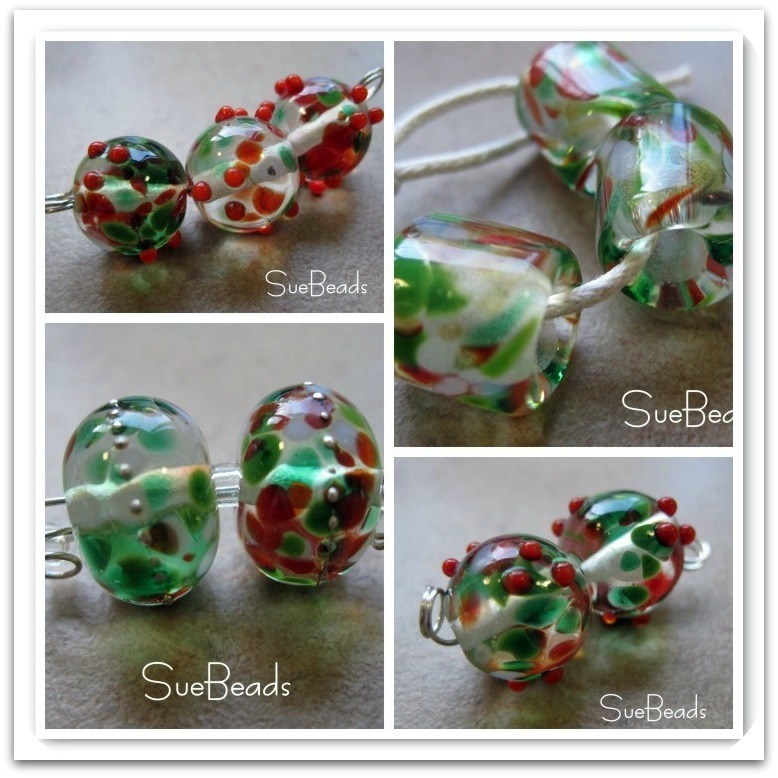 The beads were made from clear glass and a holiday themed frit! The round beads and the silver sparkle beads measure approx. 12mm, and the large hole bracelet beads measure approx. 12x11mm. All my beads are made in my studio in Pittsburgh by me, Susan Kennedy, and all are properly kiln annealed and cleaned with a diamond-bit Dremel. 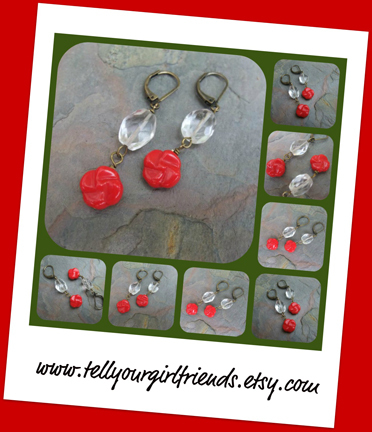 Special code CRAFTSHOW15 will give you 15% off your purchases plus a free pair of handcrafted brass or copper earring wires with each purchase of an earring bead pair. 1. Polymer clay oval toggle clasp in taupe, with a dainty lavender flowering vine and gorgeous antique white sari silk. Clay toggle measures approximately 1.5" in diameter, not including copper bail. 1. Polymer clay bead and hammered copper toggle set in rich, woodsy shades of brown. Accented with topaz hued crystals and beads, and includes sari silk in coordinating color. 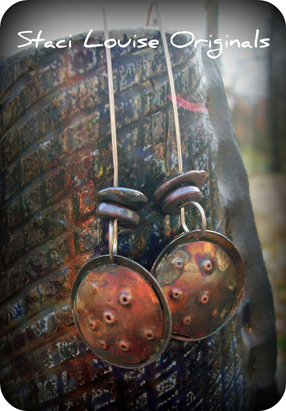 Beads measure nearly 2" in diameter, while hammered toggle measures 1" in diameter. 2. Eclectic mix of lime green and shades of gray polymer focal bead with brass center accents and beads, with cool shade of gray sari silk length. Focal bead measures approximately 1.25" in diameter. Handcrafted earrings with hollow copper lentil charms, copper coated ceramic beads from Mykonos and handcrafted, extra long ear wires in sterling silver. 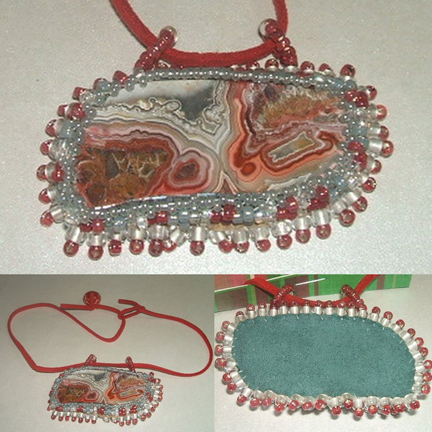 This amazing slice of crazy lace agate includes red, white, gray lines. This slice is attached to ultra suede and beaded embroidered around and finished with a smooth ultra suede in the back. This piece measures 2.5" x 1.5" and is on a suede lace. Size is approximately 1" x 1.5". Original collage made with upcycled materials then sealed multiply times (is water resistant but not water proof- so please do not shower or swim with it on). 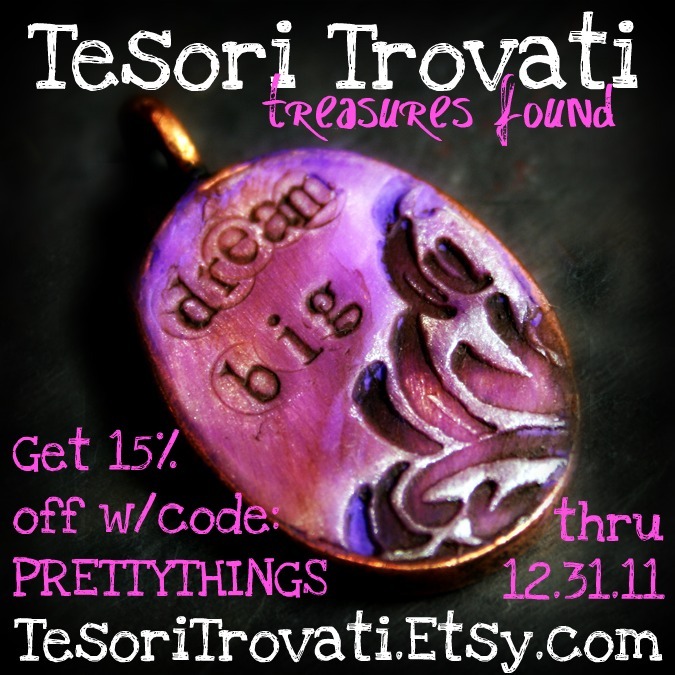 Free shipping in Etsy shop! Lovely vintage red Czech glass flower bead, stunning hand cut crystal, and antiqued brass. Perfect for your Holiday Activities: Sledding,Skating,Shopping,Eating, Partying,Wrapping,Working,Playing. You name it these work horse earrings will work for you! Good Luck! This double-sided glass pendant features an image of the Theotokos Virgin Mary and Christ Child on one side and St Michael the Archangel on the reverse. 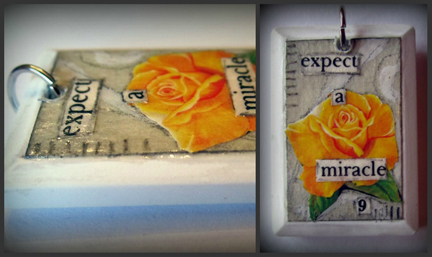 This pendant is 1.5" square, 3" long including the dangles and bail. One of the dangles is a vintage Virgin Mary medal and the other is a two-dimensional image of St Michael. I have taken a more rustic approach with the silvery lead-free solder used to seal it, thus making it appear ages old. It is not waterproof and should not be worn while swimming or bathing. Clean with any dry silver polishing cloth. It will come with a simple 16-19" necklace or you can choose to have a custom beaded necklace made for it. Size: 1.5" x 1.5" pendant, 3" long with the dangles and bail. Value: pendant only, $18, with necklace, $28. Rings are my favorite piece of jewelry to create, buy and wear. The most unique aspect of my rings – and a favorite feature of my customers – is that they are woven on strong elastic for durability and ease of wear. They are very light and comfortable, and are a great option for those who suffer from arthritis. One person will win one ring for a total of three giveaways! One Turquoise Pony bead: a little pony made entirely of turquoise and coral polymer clay measuring about 27x35 mm. Hole running down through its back to its hooves. One Mr. Brown Owl focal bead: Hand shaped in brown polymer clay with a white patina on his feathers. 34x19 mm and has a hole running through the top of his head to just above his tail on the back. One Sleepy Brown Owl bead: Owl in hand-painted polymer clay measuring about 20x18 mm and has a hole running through the top of its head to just above its tail on the back. One pair of Sleepy Foxes: Foxes in hand-painted polymer clay measuring about 19x18mm with a hole running from their tails up through their backs. Be sure to stop by the shop too! Use coupon code CRAFTSHOW10 for a 10% discount starting today and running through December 3rd. One quarter of the 'simple truth' sampler club. You people are so talented! I'll blog tweet and FB later on! Oooh I'm so excited to get my shop on! Thanks to all the super talented artists! really fun and beautiful goodies! Way to start off the day with all of my favorite magazines offered !! I also adore those earring from Staci Louise - oh who am I kidding, I love everything! Thanks for another chance to win. Will FB about this now. Again, more amazing things! I'm off to visit some shops and BUY THINGS! Oh my, the next round with sheer beauty. AWESOME! Clearly that last word should be 'us'. But you all knew that. I hope. Lori, so many talented artists here! I've replied to many of their individual blogs--not sure if that was what was intended or not. Also, I'd like to do a post on my blog Monday about the event and highlighting a few of the participants thus far. Will try to do again as you announce others! As always, you've done a great job organizing a wonderful enjoyable event that will benefit all! Many thanks! Wow, seven days of such fun! Amazing stores and such goodies! Just wow, even more fantastic bead makers i would not have found if not for Lori! wow! amazing goodies! I love all! Wow! More gorgeous items! I blogged about this and I'm commenting! I hope to post this on Facebook, too, later. I'll let you know when I do! These are talented artists - WOW! such a great idea to share so many creative people. Such lovely things! Thanks for bringing new to me artists to my attention! Off to shop! I love shiny things. Thanks for the compilation and chance to win. So beautiful! What a great selection this is! Beautiful Goodies!! Now off to drool... err...shop before work. wow so many more beautiful items! Thank you for all the opps! I have a favor/suggestion - at the end of all the days could you make one post/lists with all the links so we can bookmark it and continue to visit easily? Lori, I thought Day 1 was great, but it looks like each day will get better and better! What fun. Thanks again and once more I have my eye on owls! :D :D :D I'll facebook today, too. Such a great idea - I love seeing all the creativity. Great stuff and what a nice variety of artists. I am loving this! The beautiful work and discovering new artists. Thank you. So many moe great artists. I love the little polymer clay pony. And Erin's pieces are always wonderful, but all the artists are wonderful. 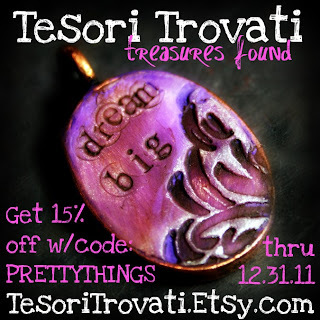 So many wonderful things to win from such great artisans. I love everything. I visited most of the shops. Will blog and let you know. Just tweeted about Day 2. Just posted to my facebook group page, Etsy/Artfire United. More gorgeous pieces!! Back to shopping! Those magazines were a great idea. I have a stack that I intend to cut out what I want to keep and recycle the rest. Oh my gosh... everything else I have seen has been fab! Way to much to comment on. Yet more talented artists here. This show is so exciting! Just blogged about Day 2 of the Craft show. Really a lot of fun to look at the goodies. It's amazing the things people can do! I'm loving those Staci Louise earrings! Gonna go comment on her blog now. Just posted it in my blog. Posted Day 2 on my blog!! Great stuff again Lori. I emailed my mailing list in addition to having it on my blog and FB pages. This is so much fun and I love seeing the creations by these talented artists! Love everything, but especially rebekahs and erins. Great idea, Lori! Love all the beads but the copper ones are my favorite!! Good morning Lori, I'm ready for day two of the Craft Show. Wonder what goodies I will find today? Another great lineup for today! I'll have to come back this afternoon when I have more time! Beautiful Prizes today! 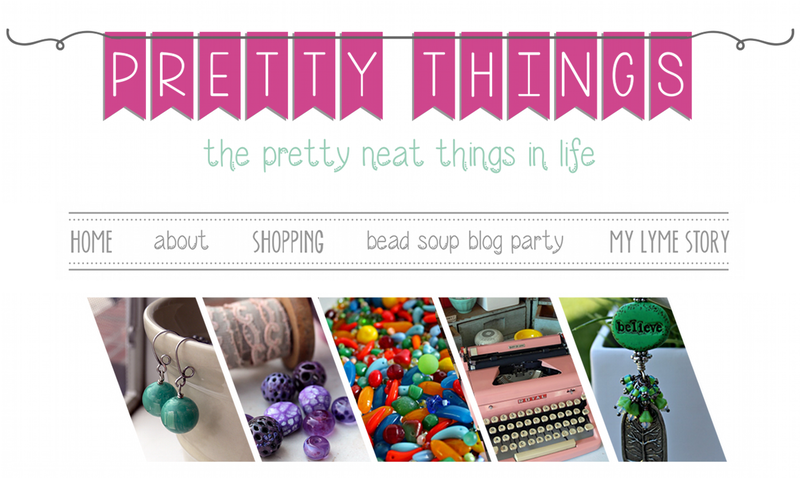 I just shopped ,I am excited to have my shop in the features today as well! Thanks for another great day! Wow - hard to pick a fav in this bunch but those rings that are beaded - great design there! Great lineup of artists! I always love looking through magazines for new inspiration. Oh wow - I really love the sleepy foxes!! What a GREAT day 2! I didn't think you could top day 1, but you did. I speak from personal experience for designers out there, Erin Prais-Hintz simple truths pendants are incredible! Truly one of a kind and made with such quality craftsmanship. Her discount through the end of the year = AWESOME!!! Wow, another great grouping of very talented people. These are just as great as yesterday. . .I can't wait to explore the rest of the week. I now hate that I didn't jump on the bandwagon when you made the call. . .oh well. Maybe next time. You are one super organized and amazing lady to handle all this. Go Lori!! Oh Lori what a great idea a Virtual Craft Show. I have been to all the (booths) for day two and I am so impressed with all the creative energy. wow what great pieces and talent!! What a wonderful selection of artists to be included with! thank yo very much!! I continue to be amazed by the variety of artists you've wrangled together for this extravaganza! I wish I had an ounce of the talent displayed on this site! Thanks to my wonderful Dad for letting me usue his computer to make these posts.. Pretty goodies! Off to share. Blogged about day 2! Having fun checking out the deals. Omgosh I just can't believe all these wonderful goodies! I am taking note of these coupon codes so I can shop later! I shared on FB business and personal page. So much eye candy, great job Lori!!!! WIll Tweet, FB and blog!!!! 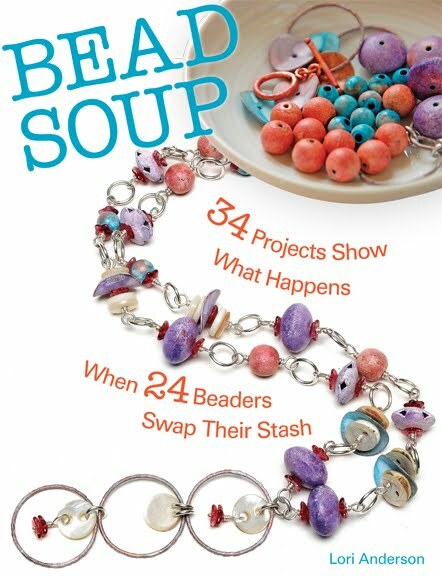 Oh, I love "Sue's beads". I've used many in my creations! I posted day two on my blog. I posted day two on my Facebook page. Wow! You have some incredible artist contributing to the craft show. Love everything I see. I have spent the greater part of this day looking at all the sites and the sites posted yesterday. I would love to be this talented. I'll have to start with some beginner beadwork and hopefully be a master some day. I especially like copper pieces. And, of course, anything sparkly. 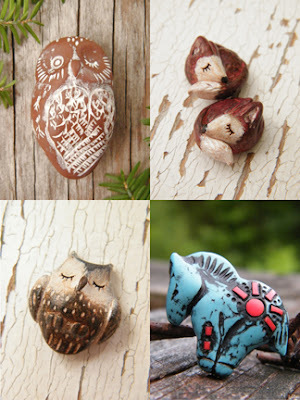 Thank you for posting this virtual craft show. I am especially partial to the copper pieces. I have spent the better part of yesterday and today looking at all of these sites. I am inspired to stop wishing I could create beautiful jewelry and just get on with it. Basics here I come. See you tomorrow. Day 2 is fabulous as was Day 1. Thank you for bringing this to us. Another wonderful show today from very talented people. WOW Lori Day 2 has another group of amazing artists. I look forward to checking out each & everyone of their shops n blogs. Off to Tweet and post on FB & my blog. How fun - several of my favorite artists here! Great discounts, too. Thanks again! wow..in awe here..these folks are seriously talented..I mean...come on! everything is soooooo pretty! off to shop...and blog and tweet..luving this ! u rock! I can hardly keep up with all these giveaways! Here's hoping I'm picked for any of these wonderful creations!! Yummy!!! So beautiful!!! I am going to being using these words over and over, I just know it with this wonderful collection of artists. Can't wait to see what is going to happen tomorrow. I am loving "discovering" these new artisians! Thank you Lori! Love! Some pretty interesting stuff, nice way to find new faves. Thanks for another day of talent and beauty!! 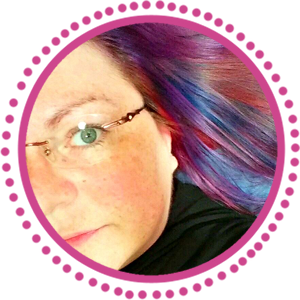 I really am enjoying the blog hop. There are so many beautiful wearable objects that the artisans have created. Thanks for hosting this fun event. wow again. what a collection of talent and lovely items! another round of amazing giveaways! Wow I can't believe I remembered to come back but I'm glad I did! Another day in the bead neighborhood! Oh gosh.... more talented and creative people. You are all an inspiration! Oh gosh... More talented and creative people! You are all an inspiration! Great selection. Your organizational skills are amazing -just gettting my Christmas shopping/baking done is enough for me. Ok I am expecting a miracle but with that many comments, I doubt it, but one can dream. so much talent, I am in awe! Some beautiful artisan beads today. What a great idea! Great way to find some new items. Love love love those staci louise earrings! so many lovely things! Love staci's earrings and always of a fan of Erin's simple truths pendants. In total awe on how you put this all together! Gorgeous metals (and faux metal! ), combined with all those incredible colors! ... does ist get any better?? I just love this showcase!!! Beautiful! So many talented artists in one place! I'm thrilled that I knew so many of the great artists featured here. Rebecca is new to me, and I'm excited to go check out all the great stuff!! Those Susan's beads are so great! Another amazing stack of talented artists! These are so beautiful. Thank you for sharing. More beautiful polymer! 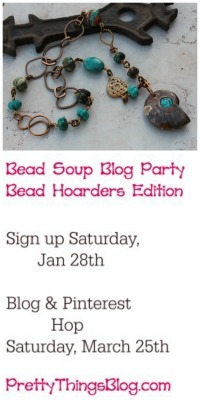 Oh please, let me win Rebekah Payne's giveaway ;-) I adore her beads so much! So much talent today, too. Particularly Tree Wings studio's beads- fantastic! Rebekah Payne's art is lovely! Love those earrings with the copper bead! And the polymer beads that are so intricate! Thanks for the links to these talented artists. wonderful artisans! thanks for organizing this!